Rich, strong, powerful men have always been able to get what they want - even back in the olden times. Back in the good old days wars were fought over ideology-just like today-only then it was hand to hand battle. Women were left home to worry, take care of the home and become widows. Unlike today--widows were most times taken advantage of. Politics played a large part in the world back then as it does today. Such was the case when the Earl of March met Eleanor Talbot. Edward was young,handsome and strong. 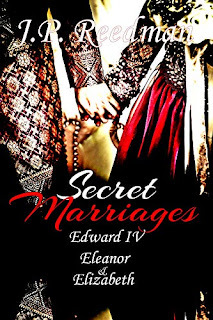 Eleanor was in his sights and he decided that he would marry her in secret to get from her what he wanted. The Earl of March became the King of England. Eleanor was left behind--he barely even thought of her after he gave her some land. Eleanor kept the secret of her marriage even unto death--even when the King committed bigamy and married another. This is a tale of love and betrayal. I found myself comparing then to now. This is the second book in this series-I liked it enough that I just bought the first--watch for my review! It is a time of trials when the Lancastrians and Yorkists fight for supremacy...and the throne of England. The Battles of Mortimer's Cross and the bloodbath of Towton lead to Edward taking the crown. Mortified by all that has happened, Eleanor seeks atonement in religion,...but will her past catch her up? Born to a Canadian soldier and English war bride, J.P. grew up in Victoria, British Columbia. but has lived in the U.K. for almost a quarter of a century. Interests include anthropology, archaeology, folklore, fantasy, the Wars of the Roses era (Richard III in particular), Robin Hood, medieval life in general, Stonehenge and the megalithic culture. Works include two novels set at the time of Stonehenge, Stone Lord and Moon Lord, and two popular works on Richard III (I, Richard Plantagenet parts 1 and 2) written from his first person point of view. Other works include a dystopian novel My Name is Not Midnight, which takes place in a post-Apocalyptic Canada, and a historical fantasy Sacred King which is about Richard III's 'return' in a Leicester carpark. Many short stories and collections are also available, the subjects ranging from high fantasy and horror to pure historical fiction. Upcoming projects are a Complete Edition of I, Richard Plantagenet (revised, with new details), a novel on Eleanor Provence, Queen of Henry III, and a mystical version of the Robin Hood legend.